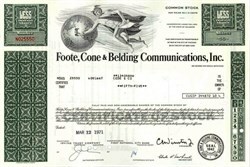 Beautifully engraved Certificate from the Foote, Cone & Belding Communications issued no later than 1971. 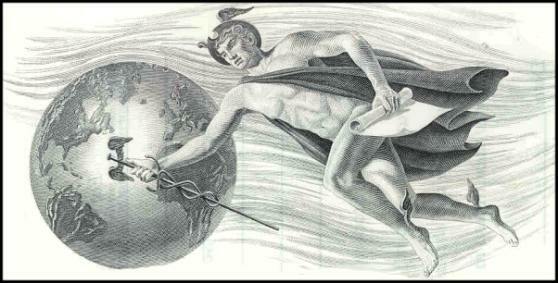 This historic document was printed by the American Banknote Company and has an ornate border around it with a vignette of Mercury flying over the world. This item has the printed signatures of the company's officers and is over 32 years old. Founded in 1873, Foote, Cone & Belding is the world's third oldest advertising agency. Today, FCB is a powerful global agency network with 2000 billings of $9.5 billion and more than 190 offices servicing clients in 102 countries. FCB is one of the top three agencies in the United States with 2000 billings of $6.3 billion and key offices in Chicago, New York, San Francisco, Seattle and Southern California. In addition, FCB ranks #10 in the world with a top ten ranking in many major markets including Argentina, Brazil, Canada, China/Hong Kong, India, Mexico, New Zealand, Puerto Rico, Spain, South Africa, Taiwan, Thailand, and Venezuela. FCB offers clients a broad range of fully integrated communications services including Advertising, Direct, Digital, CRM/Database, Field Service Marketing, Events Marketing and Sports Marketing.